Courtesy of State Library of Louisiana. 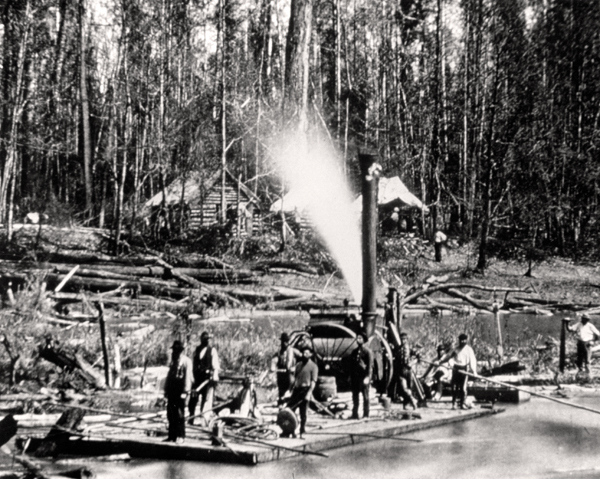 Black-and-white reproduction of a photograph of the Red River Raft clearing operations in the 1870s. Before its removal by the US Army Corps of Engineers in the 1800s, the Great Raft of the Red River had accumulated tens of millions of cubic feet of cedar, cypress, and petrified wood. The logjam blocked navigation on the Red for a distance of nearly one hundred miles. The raft removal project, initiated by Captain Henry Shreve in the 1830s, opened new territory in Louisiana and East Texas for settlement and agriculture. Its engineering audacity inadvertently reshaped the geology of the Lower Mississippi River watershed. Dirt and organic materials carried by the Mississippi River and its tributaries had created ancient Louisiana from migrant fragments of the North American continent. The floods, earthquakes, and daily processes that resulted in the Red River Raft continued the work of millennia into the American age. 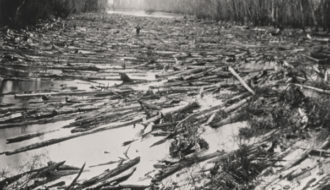 Thomas Jefferson, as president of the United States, dispatched the first explorers to report on the existence of the massive logjam: the entire width of the channel, recognizable in some stretches only by the continuing line of living trees along the shore. The Great Raft was sacred to the Caddo Indians, who organized their livelihood around the soil and water deflected by the logjam during spring floods. They told Jefferson’s envoys that an historic flood in 1800 had pushed enough debris from the Mississippi to choke the smaller river’s flow as far down as the river bottom. The rise of the steamboat and the acquisition of New Orleans by the US initiated an era of bold human intervention in the Lower Mississippi country. By the 1830s, the US Corps of Engineers had developed the specialized equipment and expertise to address the challenge of the Red River Raft. 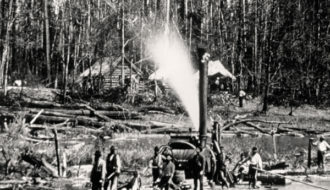 The logjam had met its match in Shreve, who designed a “snag boat” hydraulic lift and supervised its military crew in the use of dynamite and cross-saws. 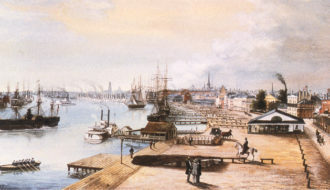 In their first day on the job, in 1832, Shreve’s men cleared the river for a distance of four miles. Through dredging and excavation, the raft removal project transformed what had been a meandering waterway of twenty-nine switchbacks to a largely direct thoroughfare for transportation and trade. Though the enterprise would continue into the 1870s and beyond, the daring of Captain Shreve would be honored in his lifetime by the designation of the new head of navigation on the Red River as Shreveport. By the end of the 1830s, the human population of the river valley had made its first exponential increase. Shreve himself had committed the most fateful act in the thousand-year history of the Great Raft when he directed his crews to dredge across the switchback near the convergence of the Red River, the Atchafalaya River, and the Mississippi. The new channel proved a boon to settlement, smoothing navigation and incidentally reducing the Mississippi River’s water level during periodic floods. In world historic terms, however, the raft removal project compromised the geological integrity of the region by initiating a switch in the course of the river, which increasingly seeks the steeper and more direct course of the Atchafalaya to the sea. By accelerating the transference currently under way at the junction known as Old River, the Red River Raft removal project set in motion the inevitable reorganization of the landscape of central and southern Louisiana. Keith, LeeAnna "Red River Raft." In https://64parishes.org Encyclopedia of Louisiana, edited by David Johnson. Louisiana Endowment for the Humanities, 2010–. Article published February 1, 2011. https://64parishes.org/entry/red-river-raft. Foreman, Grant. “River Navigation in the Early Southwest.” Mississippi Valley Historical Review 15 (June 1928): 34–55. Humphreys, Hubert. “Photographic Views of the Red River Raft, 1873.” Louisiana History 12 (Spring 1971): 101–8. McCall, Edith. Conquering the Rivers: Henry Miller Shreve and the Navigation of America’s Inland Waterways. Baton Rouge: Louisiana State University Press, 1984. McPhee, John. The Control of Nature. New York: Farrar, Straus & Giroux, 1990. Pabis, George S. “Delaying the Deluge: The Engineering Debate over Flood Control on the Lower Mississippi River, 1846–1861.” Journal of Southern History 64 (August 1998): 421–54.